Do you have an item around that you just find irresistible? 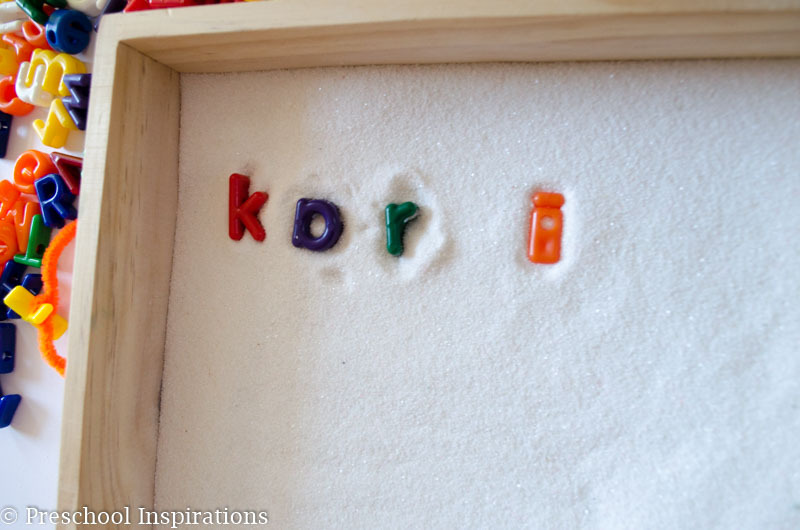 For me and my kids, it’s alphabet beads — and a sand tray. 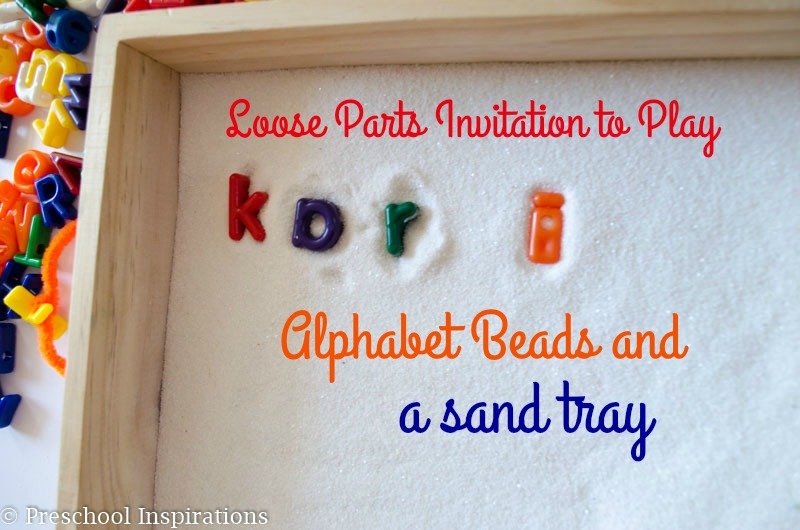 I decide to put the two together to make an alphabet bead sand tray loose parts play invitation. Two words describe this activity: pure bliss! I could just run my hands through a giant container of alphabet beads! Wouldn’t that be so fun! The smooth texture and inviting colors just pull me right in. I can’t even imagine how much more so it is for children. 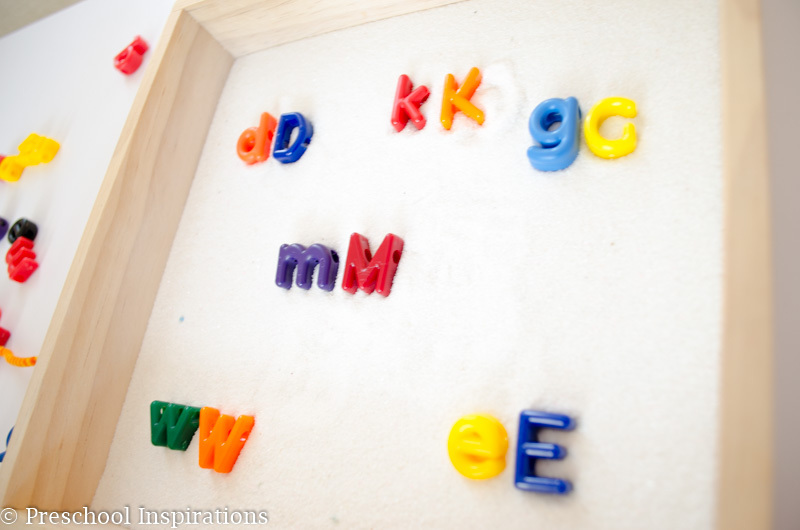 Did you know that something as simple as an alphabet bead can make a huge difference in teaching a child letter sounds, letter identification, forming words, and more!? 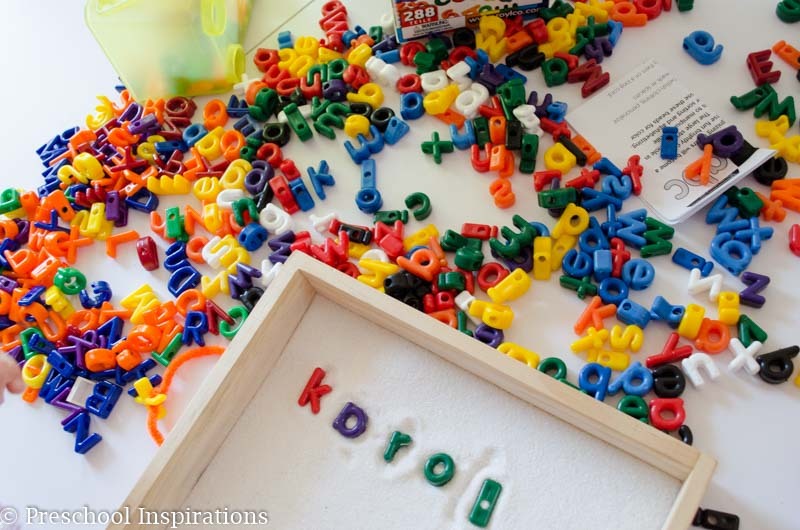 Hands-on activities are always beloved in my home, and these lowercase letter beads and uppercase letter beads get lots and lots of love. And the sand tray. I truly have a love-hate relationship with it. 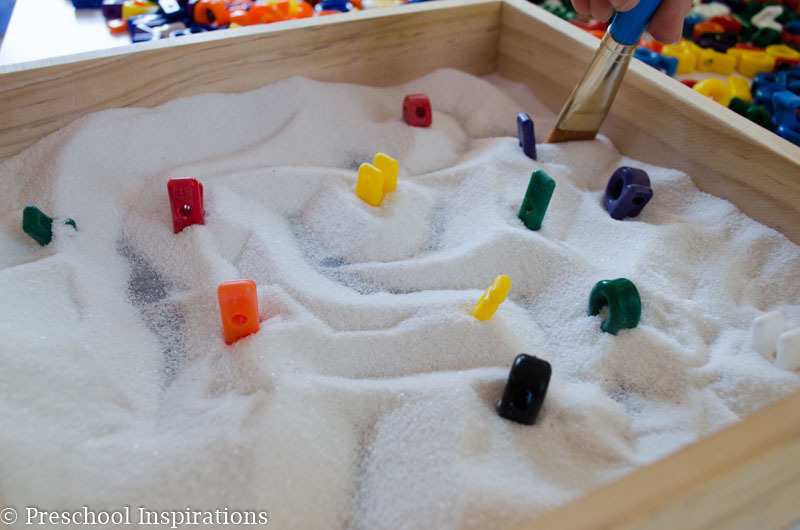 As long as the colored sand stays in the tray, I am in love. Once it’s all over the floor, in the cracks of the couch, on random toys, and sprinkled on the table like an elf emptied his pockets on it, I am not so thrilled. We work through it though because I know how important sensory motor activities are. 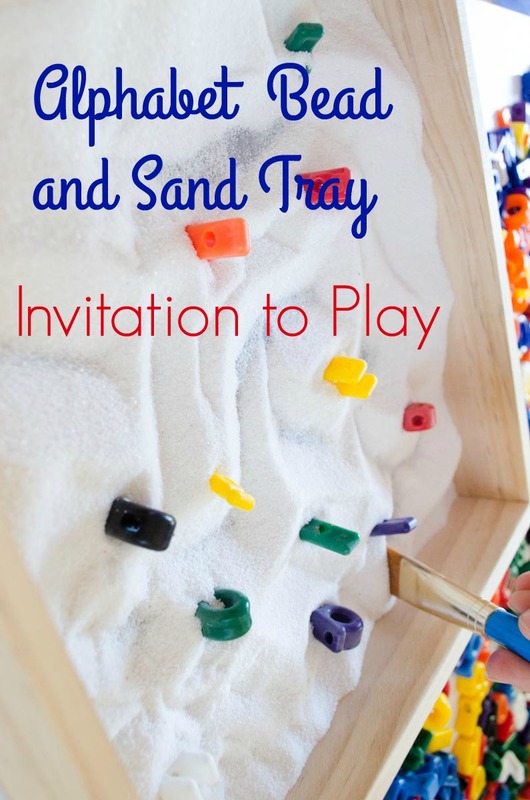 My kids and I came up with five activities during our alphabet bead and sand tray loose parts invitation to play. I laid out the lowercase letter beads , and they had to hunt for the uppercase letter beads . For this next game, my daughter would bury the letters in the sand. Then my son would have to find them all! He used a paintbrush with this, and it made it even more suspenseful. Since children never like to write their names, this was like pulling teeth. Just kidding. Sometimes I like to play with you all. You’re still here, right!?! OK, good! For reals this time. Since children adore spelling their names, I didn’t even come up with this or suggest it. It was the first thing they wanted to do! Then they wanted to spell the names of their friends and of their grandparents. And if we had pets, I’m sure those would get thrown into the mix! Since I have a new reader on my hands, we decided to work on some word making! It’s nice to mix things up and not just stick to writing. Plus, did I mention how irresistible letter beads are!?! This last idea was probably my favorite because it was so unique and interesting. My daughter laid out all the letters and ran the paintbrush through the letters like a maze. 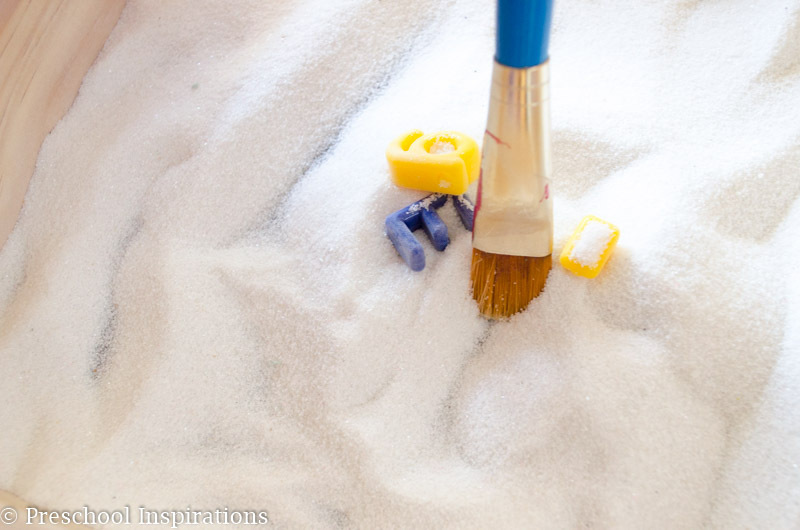 If you don’t happen to have colored sand around, salt would be a perfect substitute. Our letters were definitely “dusty” looking after play, so I rinsed them off in the water. 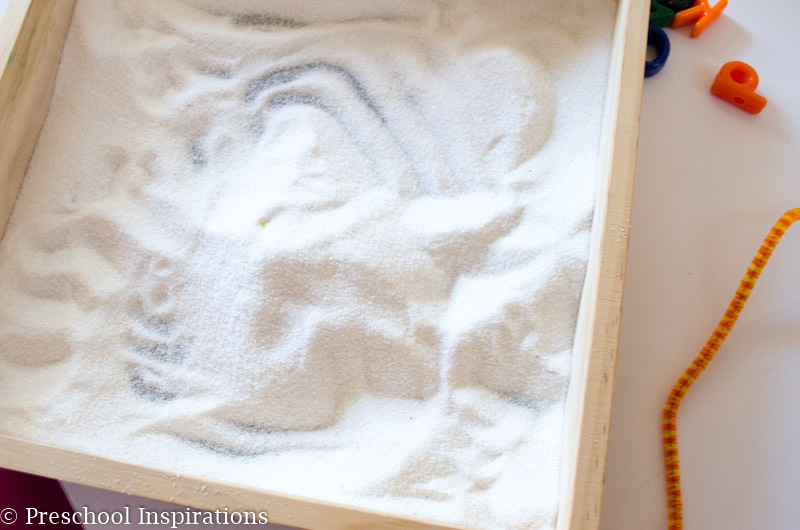 Oh and I also recommend shaking the sand out of the little lacing holes…unless of course you love little sand trails all over the floor :). 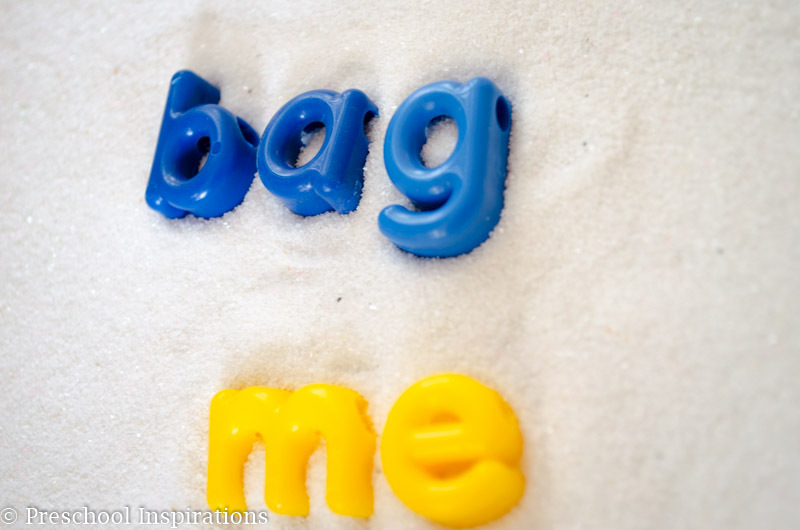 To see more alphabet activities, check out my pinterest alphabet board. 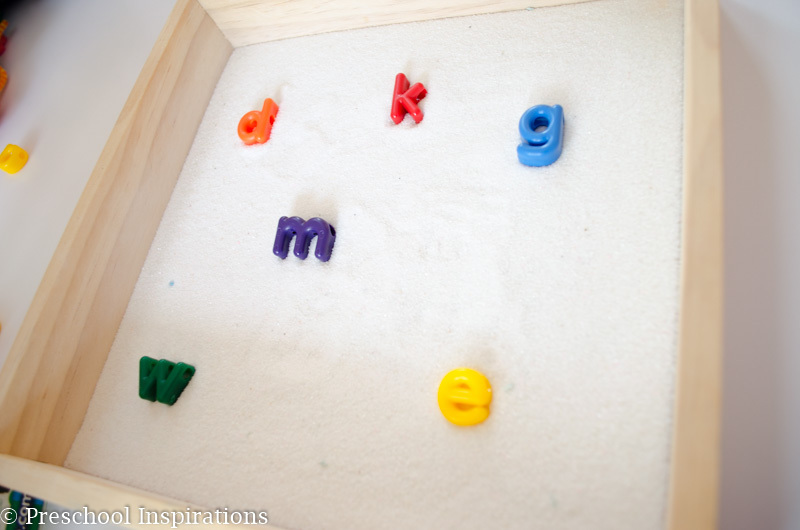 Follow Katie | Preschool Inspiration’s Alphabet board on Pinterest.